Suite Sports: Super Bowl LIII Preview: A Rematch, Young vs. Old, Two Lucky Teams and Gambling! The Patriots are old. Not just in a they've-been-around-forever way, either. It's not up to the minute data, but based on the 53-man rosters from Week 1, the Patriots were the 3rd-oldest team in the league (only the Falcons and Raiders were older). The Rams are young. And not just in a new-kids-on-the-block-just-had-the-first-pick-a-few-years-ago way, either. Based on those same 53-man rosters, the Rams were the 4th-youngest team in the league (behind Cincinnati, Cleveland, and Dallas). In more ways than one, it's Old vs. Young. Brady is the oldest quarterback in the league. Goff is one of the youngest. Bill Belichick is one of the oldest coaches in the league. Sean McVay is the youngest. Historically speaking, there haven't been many Super Bowls between a decidedly "old" team and a decidedly "young" team. Generally speaking, a gap of at least a year (by average age) is more than noteworthy, and a gap of two full years is almost unheard of (it would likely be the actual factual youngest team versus the oldest team of that season). If you're looking for a point of reference over the last few decades, there are a few on each side. The markedly younger team won in 2013 (Seattle), 2010 (Green Bay), 2007 (New York), while the markedly older team won in 2009 (New Orleans) and 2000 (Baltimore). For the most part, however, teams have usually been pretty close in age. If you're looking at experience rather than age, the gap is even wider. New England obviously has a ridiculous amount of postseason (and Super Bowl) experience. This is New England's fourth trip to the Super Bowl in the last five years and they've played in now eight consecutive AFC Championship games. If you're looking for members of the Rams with extensive postseason experience, you have C.J. Anderson and Aqib Talib, who played on Super Bowl teams in Denver, Brandin Cooks played with New England last year, Sam Shields played in one Super Bowl with Green Bay, and, well, that's just about it. Again, though, there are a fistfull of examples of postseason experience either mattering or not mattering at all. Even two weeks ago, the wildly more experienced Patriots beat the Chiefs while the wildly less experienced Rams beat the Saints. Last year, the inexperienced Eagles beat the very experienced Patriots, and in 2015, the very experienced Broncos beat the much less experienced Panthers. All of this to say, age and experience probably won't matter all that much and this whole section was kind of a waste of time. The elephant in the room here is that both of these teams were the beneficiaries of a lot of luck two weekends ago. A few breaks of the game or a few calls by the officials could have resulted in a Chiefs-Saints Super Bowl. The Rams, most obviously, were kept alive thanks to perhaps the most inexplicable no-call in NFL history and hung on to win in overtime. The Patriots, meanwhile, had a few very close calls go their way, and of course won the coin toss in overtime, leading to a growing conversation about whether or not both teams should have the right to possess the ball. It would be Seussical to try to predict one team to be luckier than the other and end up on top because of it. The reason to bring it up is New England's history in the Super Bowl. We mentioned it in this space last year, but we'll update it now - the margin of victories in New England's Super Bowl appearances are 8, 6, 4, 4, 3, 3, 3, and 3. The Patriots haven't had one of those 49ers-Broncos or Cowboys-Bills style blowouts. And based on their team this year, I wouldn't expect one here - against other good teams they grind out small edges and hope and pray that their experience and poise actually matters. And it usually does. Two weekends ago, the Patriots showed a willingness to run the ball, over and over again, even when they weren't really picking up substantial portions of yardage, just for the purpose of bleeding clock and limiting the number of possessions that the Chiefs would get. They only averaged 3.7 yards per carry for the game, but that wasn't the point - the game ended with the Patriots having held the ball for almost 44 minutes, compared to just under 21 for Kansas City. All things considered, Kansas City's run defense held up reasonably well. During the season, the Chiefs allowed 5.0 yards per carry (31st in the league), so in terms of raw yardage, they did better than expected. Where New England had a lot of success, though, was converting 3rd downs on the ground, even at yardage where you'd usually expect them to pass. The Patriots were 5-for-7 converting third downs on the ground (not including a draw play on a 3rd-and-17 that obviously doesn't seem relevant), keeping drives alive, grinding out extra snaps, milking the clock, and ended up winning the game in large part because of it. We wouldn't be surprised to see a similar strategy out of the Patriots here. The Rams don't have quite as explosive an offense as the Chiefs do, but the Patriots should still be incentivized to keep them off the field. The good news for the Patriots is that the Rams were the only team in the league with a worse rushing average against than Kansas City was. If the Patriots were able to control the pace and the clock against Kansas City, we'd probably expect them to be able to do the same against Los Angeles. Aaron Donald is always tough to block, so expect the Patriots to double team him on every inside run. Outside of Donald, though, there isn't much to worry about. The one strategy that might be viable for Los Angeles is to excessively crowd the box, not unlike what Kansas City started to do in the second half of the AFC Championship game to a decent amount of success. The Patriots lack a true downfield threat, so crowding the line of scrimmage and forcing the Patriots' receivers to win one-on-one matchups at the top of the route might be something worth trying. If Julian Edelman or Chris Hogan can shake free for a few big plays early, things could get dicey, but from our perspective it seems like the choices are to either gamble that New England can't create enough separation to make a big difference in the passing game, or risk death by 1000 cuts on the ground. You can wager on whether either team will score in the first 5-7.5 minutes of the game, in 30 minute increments, with increasingly beneficial odds. A "No" on 5 minutes you have to lay -165, then -140, -115, +120, +135, and +185. I like all of these bets. I would imagine that whoever ends up with the ball first will try to grind out a long drive - I wouldn't expect to see a quick score. Similarly, I wouldn't expect any long scores. The Over/Under on the longest score of the game is 49.5 yards, and I love the under. As it turns out, so does everyone else - you have to lay -155 to put down a bet. The total number of punts is listed at 7.5, and I again like the under. For reference, the Patriots and Chiefs combined for seven punts two weeks ago, the Rams and Saints combined for eight. The Patriots and Eagles combined for, well, one punt in last year's Super Bowl. 7.5 seems a bit low for me, and the public seems to agree, you'll have to lay -140 here. If you expect Aaron Donald to go nuts, you might want to bet on over 5.5 sacks for the game (and you'll get nice odds to do it - +210). Donald might be able to come up with two or three on his own, and the Patriots all year have been able to manufacture a pass rush when they need it - they sacked Patrick Mahomes four times in the AFC Championship and got Phil Rivers twice the week before. Jared Goff has only been dropped once this postseason and the Rams have one of the best offensive lines in football, but a Belichick specialty over the years has been to get pressure on the quarterback regardless of the talent on either side of the line of scrimmage. If you think the Patriots will stick to the script and the game will be close, you can bet on the game to be decided by exactly three points (either way, doesn't matter who wins), you'll get a +375 return on your investment if it is. Exactly six points is +900, exactly seven points is +700. No's on each of those bets will cost you -500, -2000, and -1200 respectively, so while they're obviously safer bets, I'm not sure I like the value there. Similarly, given the Patriots proclivity for late dramatics, you can bet +190 for there to be a lead change in the fourth quarter. Come on, you always take the over on these. Who wouldn't want to milk that song as long as they can? Tails never fails, or so we used to say on PS2. Since I'm banking on New England looking to exploit the Rams' shoddy rush defense, and on LA looking to re-establish Todd Gurley and get C.J. Anderson some more touches, it seems like a solid bet that the first play with be a handoff. Why fight it? I see the Pats marching methodically down the field and punching it in, much like they did against the Chiefs two weeks back. If you give Belichick and Brady this much time to game plan, they're gonna have somethin' for ya. The Rams play a lot of man-to-man coverage, and the Patriots historically have struggled against man-to-man coverage, especially this iteration of the Patriots that's all tight ends and slot receivers with somewhat of a dearth of talent on the outside. The Chiefs played a lot of man-to-man against New England, but it's not like Tom Brady had much trouble finding open receivers. That said, Los Angeles has a more talented back seven than Kansas City does - Aqib Talib, Marcus Peters, and especially Nickell Robey-Coleman had impressive seasons as individuals, and seem to match up well against New England's offense. Robey-Coleman was their most effective corner, and he often lines up in the slot, opposite New England's best receiver in Julian Edelman. Against New Orleans, the Rams shut down the passing game outside of check-downs to Alvin Kamara. That there is part of the rub. Tom Brady has made a career of checking down to his running backs rather than forcing the ball downfield. The downside for the Patriots is that Kamara's performance is more fluke than trend - the Rams were one of the best teams at defending the pass against opposing running backs (4th-best in the league per DVOA). The Rams have had a suspect pass defense at times, but a lot of that has been their secondary getting burned deep - they ranked 22nd in DVOA against the deep pass, but 6th-best against the short pass. That seems to favor Los Angeles - the Patriots just don't have a true deep threat anymore without Josh Gordon in the lineup. There are windows for the Patriots to exploit. Tom Brady loves throwing over the middle, and that's a huge area of weakness for the Rams - they ranked just 28th in the league on throws to the middle of the field. On the flip side, defenses looking to disrupt Brady have done so by generating pressure up the middle, right in Brady's face. The Giants did it twice by lining up Michael Strahan and Justin Tuck at defensive tackle. The Jets upset the Patriots in 2010 thanks to Shaun Ellis wreaking havoc in the middle of the field on a three-man rush while New York dropped eight defenders into coverage. Terrance Knighton dominated the New England interior line in the 2013 AFC Championship game, and Grady Jarrett almost won the Super Bowl beating the Patriots up the middle in 2016. It's been a recipe for success over and over again, so if Aaron Donald shows up in a big way, the Patriots aerial attack might need to make some adjustments. The Rams have been hot and cold throwing the ball all year, especially since receiver Cooper Kupp went down with an injury, but LA has plenty of weapons. It will come down to Jared Goff who, in a microcosm of his entire season, perhaps, was ice cold for nearly half of the NFC Championship game in New Orleans, before leading an epic comeback in the Dome. 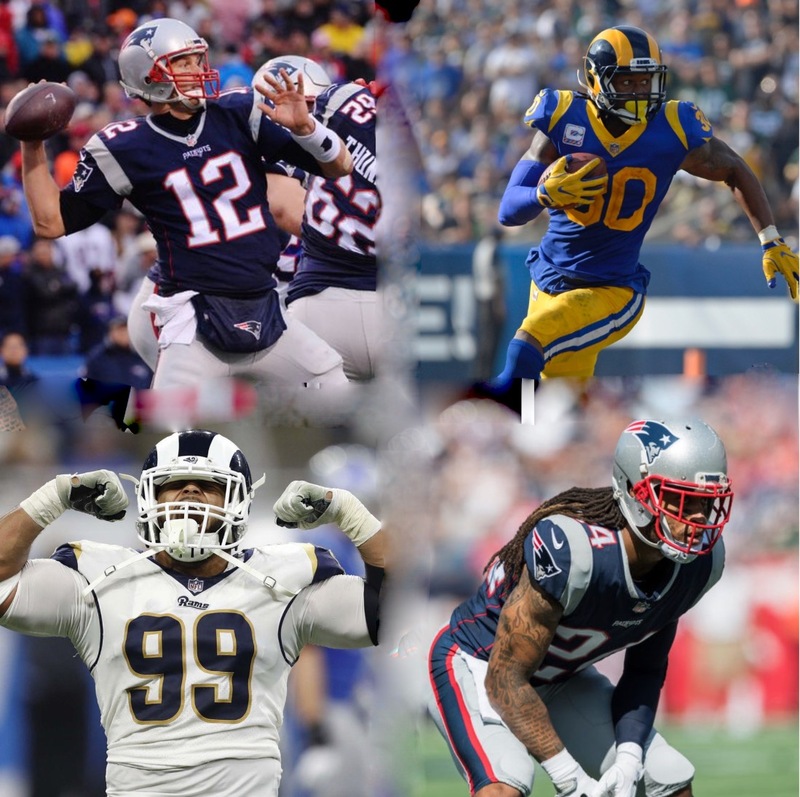 With no Kupp, and Gurley limited as a weapon out of the backfield, the Rams will largely rely on Brandin Cooks and Robert Woods, who have both been phenomenal this season, but leaning heavily on two receivers could play into New England's hands. Cornerback Stephon Gilmore has been every bit an All-Pro for the Pats, and J.C. Jackson, undrafted out of Maryland, has emerged as a reliable starter on the opposite end down the stretch. It will be interesting to see how the Patriots play this, but look for Jackson to get help against one of the Rams' top-two receivers, while Gilmore attempts to smother the other by himself. The other question will be how LA's line holds up against New England's pass rush. Trey Flowers has had a nice year, but the Patriots have seen some success blitzing this postseason, with Kyle Van Noy collecting a pair of playoff sacks rushing from his linebacker spot. If New England can get away with rushing four, it's hard to see Goff finding much room to throw. Neither of these teams are great at defending the run, and both are pretty darn good at running it, but there will still be questions when the Rams keep it on the ground. The biggest one, of course, is the health of star running back Todd Gurley. The Rams held Gurley out at the end of the regular season, and he just hasn't looked like himself since. Luckily, backup C.J. Anderson has been a revelation, rumbling his way to three straight 100-yards games, before being held in check in New Orleans. The Rams, like the Pats, have a stout offensive line, and they've also been very lucky in terms of health. LA's line has also helped its running backs lead the league in yards rushing this year, and yards gained before contact. So, if the Rams hope to pull off the upset, pounding the rock might not be a bad idea. As Jeremy mentioned above, this game is old vs young, and experienced vs inexperienced. For that reason, I've got to go with the Patriots, and I honestly don't see it being all that close. New England has gotten back to running the football, and they've got three really good backs that can wear out a mediocre Rams' rush defense, and keep the LA pass rushers from pinning their ears back to go get Brady. On the other side of the ball, the Patriots are just cohesive enough to hold it together, and I still don't trust the Rams to play a complete game, nor am I sure Todd Gurley is fully healthy, even now. I like the Pats to jump on top early, keep running the ball, and force Jared Goff to play from behind again. In Bill Belichick's career in New England, he's 16-1 in the playoffs against a new opponent (i.e. a team New England did not face in the regular season). They're 13-9 in rematches. The Patriots did not play the Rams this season. Worth mentioning. Who you like in this game comes down to how you choose to evaluate the playoffs in general. Do you back the team that was better all season, or do you back the team that's playing better right now? If you're looking at the full season, the Rams are clearly better. They lost fewer games, and their losses weren't to teams like the Dolphins and Jaguars and Lions, they were to the Saints and Bears and Eagles, they had a better offense, a better defense, and better special teams. There isn't a metric in the world that credibly says that the Patriots have been better than the Rams since September 1st. But the more you weight the sample size towards recent performance, it starts to favor the Patriots. Right now, they're the hot team. Their defense has shown steady improvement over the last two months, to the point that they were legitimately great in their two playoff wins. If you're backing the Patriots, you're nervous about two things in particular, both of which are outlined above. First, Aaron Donald and Ndamukong Suh versus the interior of the New England offensive line. Tom Brady is historically great against pressure coming off the edge - he'll just step up into the pocket and rifle a throw downfield to a slot receiver on a crossing route. Tom Brady is historically pedestrian against pressure up the middle. He doesn't escape the pocket well. The second thing you're nervous about is the Los Angeles offensive line. They demolished teams on the ground this year, setting an all-time record in Football Outsiders' key stat for offensive line play (Adjusted Line Yards). With New England having a suspect run defense, the Patriots' strategy of bleeding clock and keeping the other offense off the field could be turned on them here. If you're backing the Rams, however, you're nervous about more than just that. You're nervous about Tom Brady having yet another Tom Brady-esque game in the Super Bowl. You're nervous about the Patriots having a handful of very specific strengths that match up with a handful of your own very specific weaknesses. You're probably worried about Jared Goff. How good is he actually? And how will he play against Bill Belichick? You're worried about Todd Gurley's no-show in the NFC Championship game. You're worried about your best receiver having played for the Patriots last year, so you'd probably assume they have a decent idea of how to cover him. All in all, the game is extremely, extremely close on paper, but the matchups seem to favor New England. As has been the case so many times over the last two decades, two teams that look this similar on paper usually end up playing a pretty close game. And in a pretty close game, it's important to keep in mind that one team has Tom Brady and Bill Belichick, and the other team doesn't. For almost 20 years, I've been trying to figure out how many points that's worth in a given game. I'm not sure how many it is exactly, but for now, I'll trust that it's enough for the Patriots to come out on top.